Rivet Removal - I butchered my original rivets during removal so I'm showing removal with test rivets. 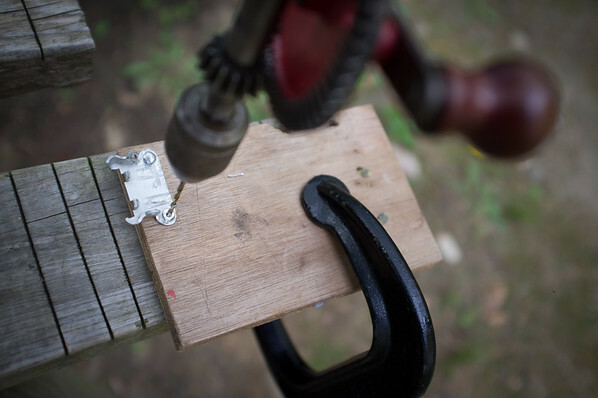 Start by clamping the piece down if you can and filing the head of the aluminum rivet flat. Next take a small punch and mark the center of the rivet by hammering the punch down. I learned that a punch has a 90º angle to the point, and a scribe is 60º. Now take a small drill bit in your hand operated drill and slowly start drilling into the head. The hand operated drill bites quickly and very efficiently. Go down as deep as you can comfortably go without breaking the bit. I didn’t break a single bit with the hand operated drill but broke three with the battery powered drill. 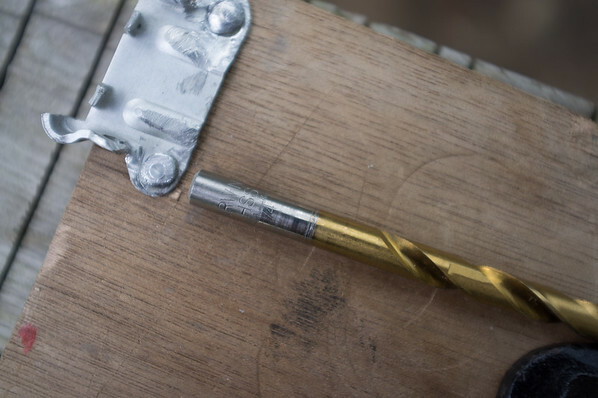 If you break a drill bit get it out with pliers even if you have to chisel around the head of the rivet to get to it. 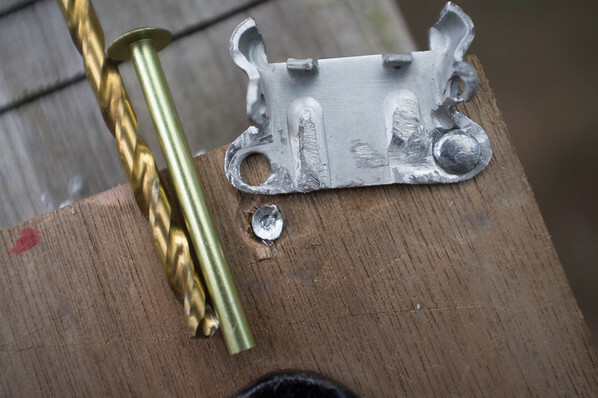 Drilling a broken bit is very difficult to do without a drill press and you could lengthen the job by hours... I did. Once you have a really nice pilot hole in the rivet go to a larger drill bit. I went straight up to 1/4 inch and took down the majority of the rivet with that. I stopped when I thought I might start digging into the face of the aluminum clip. I then switched to a drill bit that was just about the same size of the rivet shaft and continued drilling until I could lift (lightly pry) the part off of the remaining rivet. 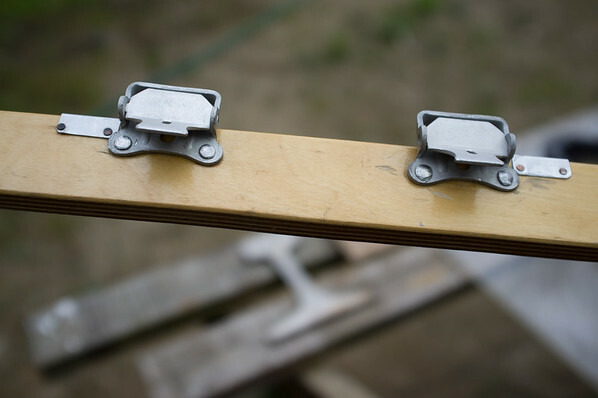 If you’re working on a piece that has two rivets, get them both to this point and then take the aluminum clip off. 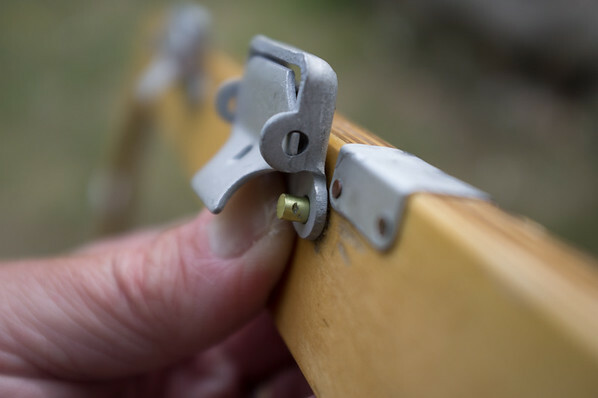 Taking one side off before the other can bend the clip. It is possible to use a chisel to get the head off but it can make a mess of the aluminum part. A chisel with one flat side is probably better then the double edged chisel I tried. Now see if you can push the rivet out. The rivets from the factory can be very tight. Try tapping it with the punch driving into your original pilot hole. If it comes out you’re done, if not, continue drilling into the bit with the small bit. This weakens the rivet and eventually the rivet will start to turn with the drill bit. If not, remove the drill after you have a decent hole, try driving it through with the punch, or try grabbing the head on the other side with pliers and rotating (be careful not to damage the wood if you try this). If the rivet still doesn’t move drill some more. If you can’t drill any more (because of bad angle, etc.) 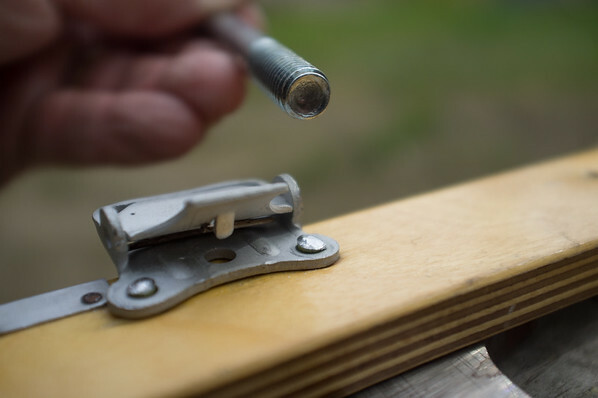 go to one size larger bit and try to make the rivet turn (or use and easy out) by biting the bit into the rivet but not cutting it, turn the drill bit very slowly with medium pressure. You can feel the pressure you need with the hand operated drill here. When the rivet begins to turn you’re as good as out. Remove the rivets and admire your fine drilling. Last edited by DLee on Sun Jun 14, 2015 9:09 am, edited 2 times in total. The trick with the hammering of the rivets seems to be, very simply, the length of the rivet. Finding a tool to reach in and actually hammer the rivet is the next challenge. Like many others before me, the concave end of a large bolt works well. The rivet head can come out very shallow though and having something flatter can help shape the head. 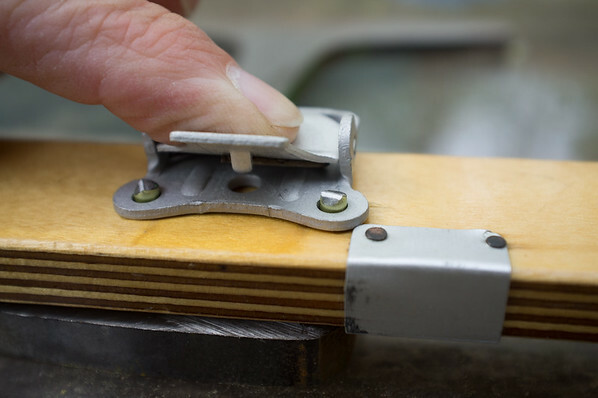 In the picture below you see that the bolt was too concave to completely flatten the rivets against the clip. 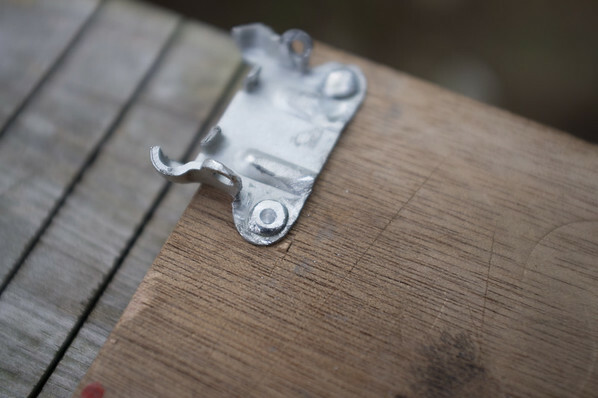 Install the rivet with the shaped head against the wood side of the work piece. 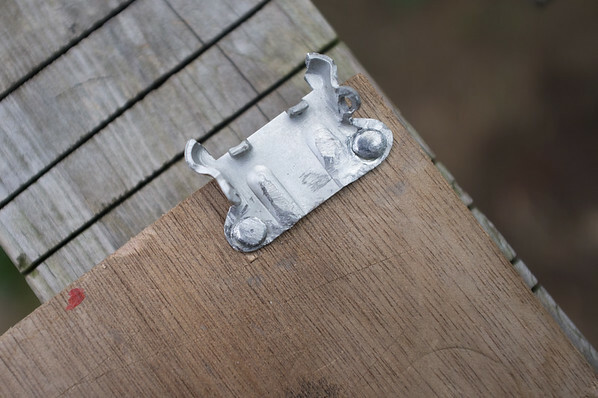 Place your aluminum clip or replacement piece over the working end of the rivet and press it down tight against the wood. The height of the rivet above your piece is the critical measurement. I learned online, and with some testing, that the height of the rivet should be half the width of the rivet, above the replacement part. So for example, if the rivet were 4mm thick, your height above the part (with everything compressed) would be 2mm. I marked this height with a small pair of wire nippers. 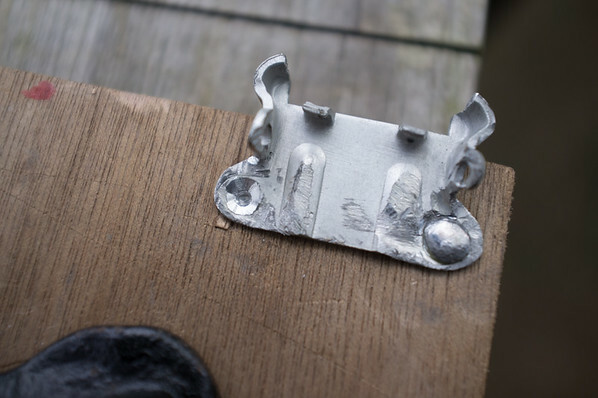 After marking and checking the marks, remove the rivets and cut them. Any decent size cutting plier will work fine. 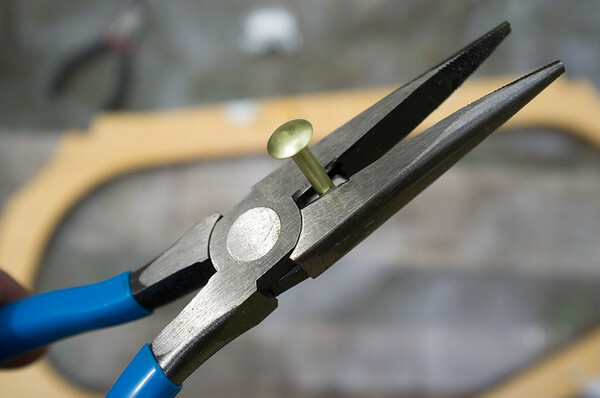 I used a medium sized needle nose plier which is a great tool to have in your bag. Obviously this is a ballpark estimate and you’ll be tempted to go longer. I tested going longer - about the same height as the width - and it works fine but takes about twice as much hammering... which was A LOT of hammering. Go higher than that and you risk having the rivet bend. If the rivet starts bending just take it out before it bends too far and put a new one in. Put the shaped side of the rivet on something very hard, anvil-esque. 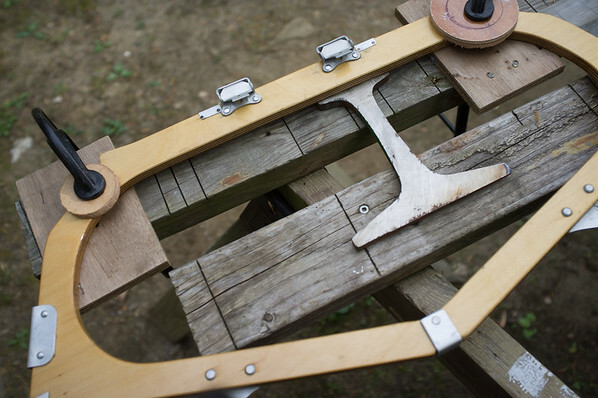 The smoother the surface the less damage will be done to the head, and clamp the entire assembly down if you can. Now start hammering the end of the rivet with your bolt. I worked the bolt around in a circular motion to help shape the head. Once the rivet head starts to take shape you can spend more time hammering straight down letting the concave bolt do the shaping. My bolt was actually too concave and I used the hammer alone and the head of the bolt to finish the head. 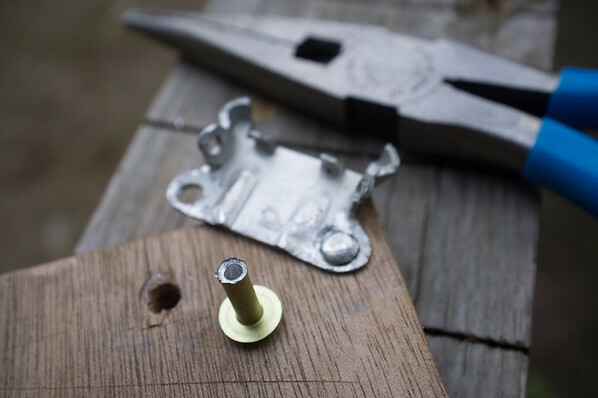 If your piece requires two rivets, do them in an alternating process so that both are tightening the replacement part evenly. The factory rivets seem to expand a tremendous amount when they are machine pressed. I’m not sure how much the hammered rivets expand in the wood. Although my rivets came out very tight and strong. When I later removed them (as a test) they were much easier to get out of the wood than the factory ones. For this reason it’s probably not a bad idea to fill the hole with varnish before hammering the rivet home, sealing the wood from water. I of course forgot to do this and I’ll report back if the black death starts creeping out around these rivets. Last edited by DLee on Sat Jun 13, 2015 11:47 pm, edited 1 time in total. 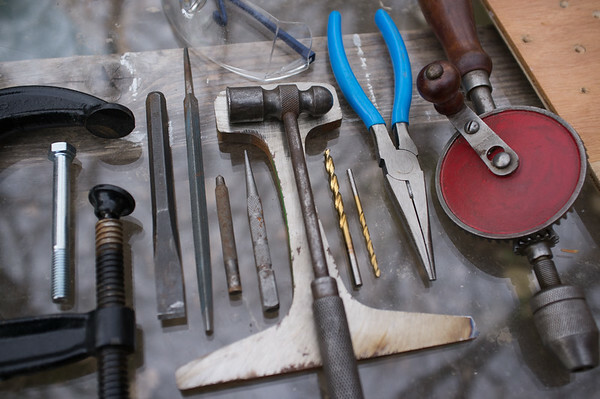 This is the basic set of tools that I ended up using for the job, with a few more thoughts. The hand drill was the real key to success here. I had a nightmare of a time working with a cordless drill. The hand drill bit into the aluminum very clean and smoothly, but I must admit that this drilling was done into the replacement rivets I got from Long Haul. It's entirely possible that the original Klepper factory rivets are somehow harder. When I have to do this again, I will definitely start with the hand drill. The ball peen hammer worked great for beginning to shape the head of the rivet. But you really want a tool that reaches in and under the edge of the aluminum clip to hammer the rivet head down on all sides. I think the head of a carriage bolt might work pretty good for this as well. This isn't rocket science by any means, and many have done this before, so please add your suggestions and comments. I like your use of an old fashioned hand drill. Electric drill tend to be too fast. Fantastic tips DLee. This is bound to get a lot of reads. Great pictures too. Thanks for taking the time to put this together.